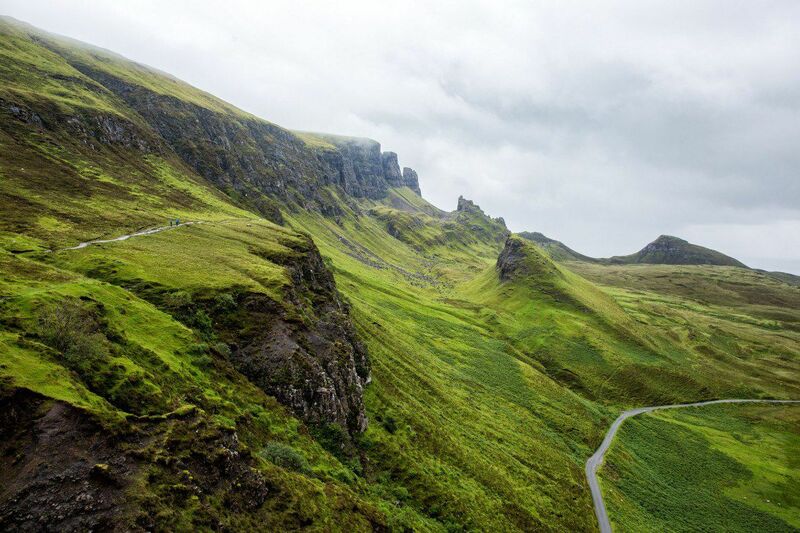 For one of the most spectacular views on the Isle of Skye, do not miss the Quiraing. 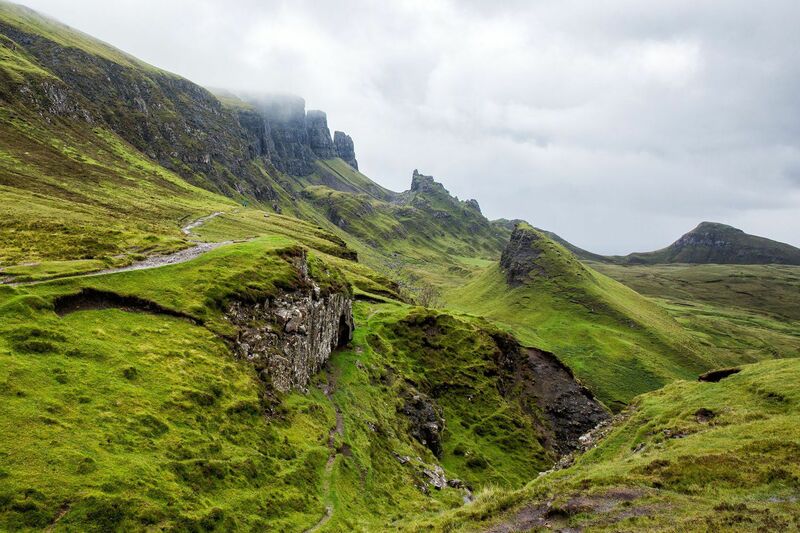 These dramatic cliffs are gorgeous, rain or shine. 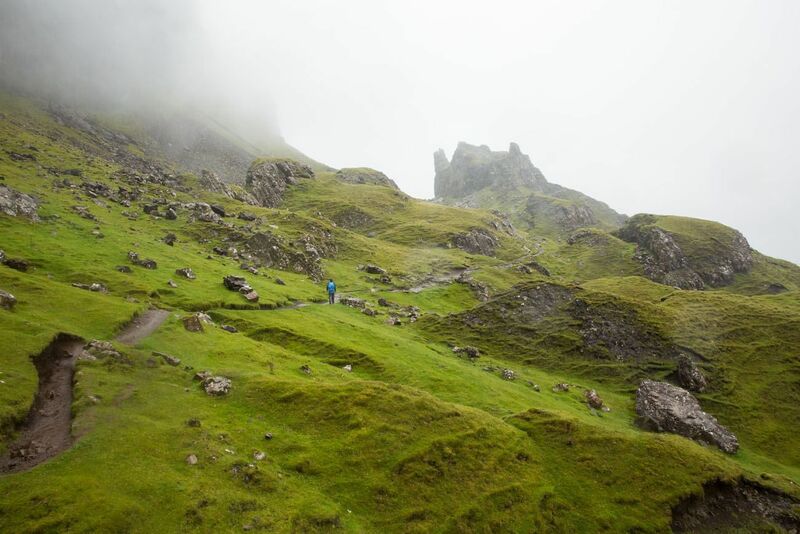 The hike around the Quiraing was high on our list. 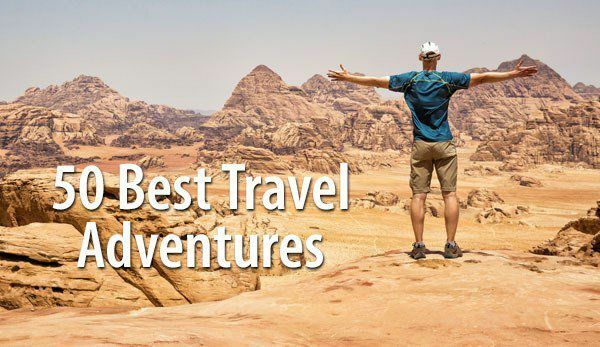 There is no better way to see the scenery than hiking around it (or maybe, nowadays, flying a drone…but that is another story). Of course, this is Scotland, and the weather can be very unpredictable. Or maybe it is predictable, if you just expect it to rain all of the time. Which it pretty much did during our entire three day visit on the Isle of Skye. 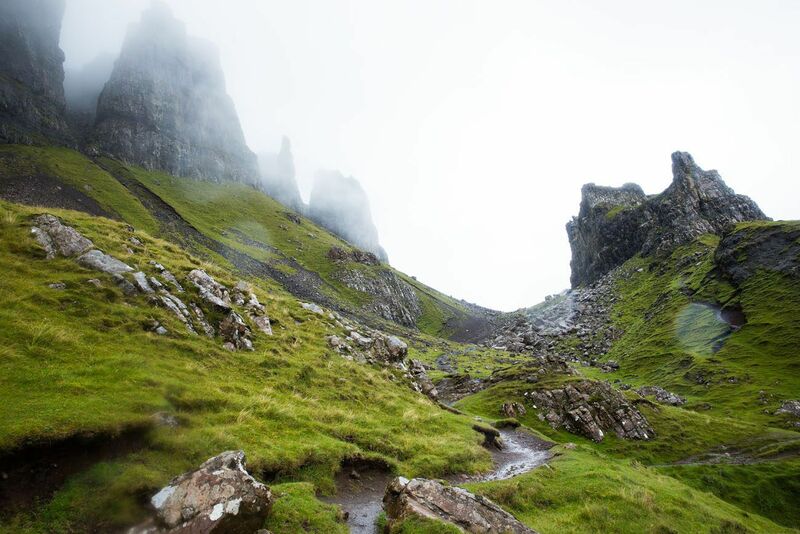 When we arrived at the car park for the Quiraing, it was pouring. A blanket of clouds hid the mountaintops from view. The sky was gray, everything was soaking wet, people were running back to their cars…not great conditions for a two hour hike through the mountains. We sat in our car, wondering if we should come back later. And then, something amazing happened. All of a sudden, it stopped raining. Like someone turned off a faucet. This was our chance. The four of us raced up the hill, expecting just to snap a few photos of this amazing landscape before the next downpour started. But to even have this chance, to have these magnificent views, we were like kids on Christmas morning. And it is gorgeous here, even in the rain and fog. 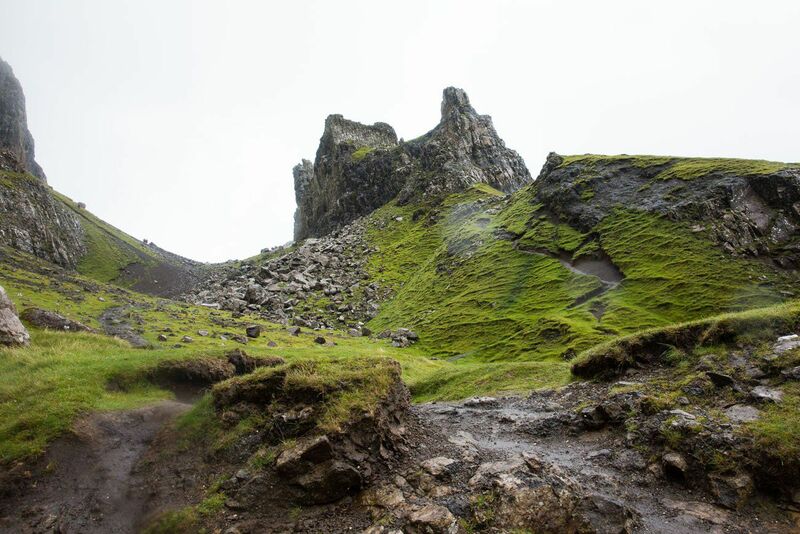 We planned to hike around the entire Quiraing, a journey that would take us 4.5 miles (7 km). With weather conditions like these, hiking the entire trail was almost impossible. But we could still hike as far as possible, at least until the next rain shower, right? The four of us half walked, half ran along the trail to the spikey rocky formations in front of us. It was a race against Mother Nature. 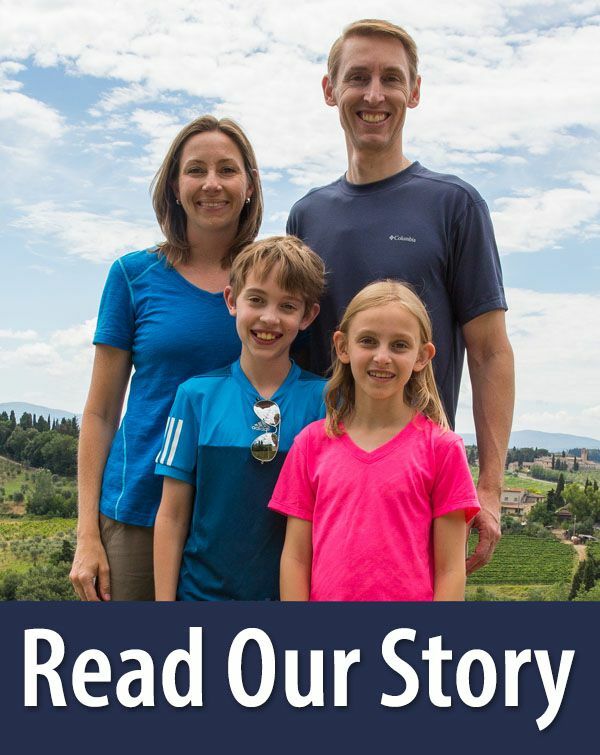 A race we knew we would lose. How far down the trail could we get until the skies opened up, dumping cold rain down onto us? It didn’t take long. Well before we got to the pinnacles, it started drizzling. The wind picked up, blowing the cold rain into our faces. Still, we were having so much fun, we couldn’t turn around yet! Once we got to the pinnacles, the mists were moving lower, creating a very ominous, slightly spooky appearance around us. At this point, the trail continued up through the pinnacles, to the top of the mountain looming above us. The low-lying mist and windy conditions made it unsafe to continue any farther. But at least we made it this far (and had such a good time doing so). Now, it was a race back to our car. By now, it was really raining. The trail was slick and muddy, we were drenched, and a wee bit chilly. But these views made it all worthwhile. 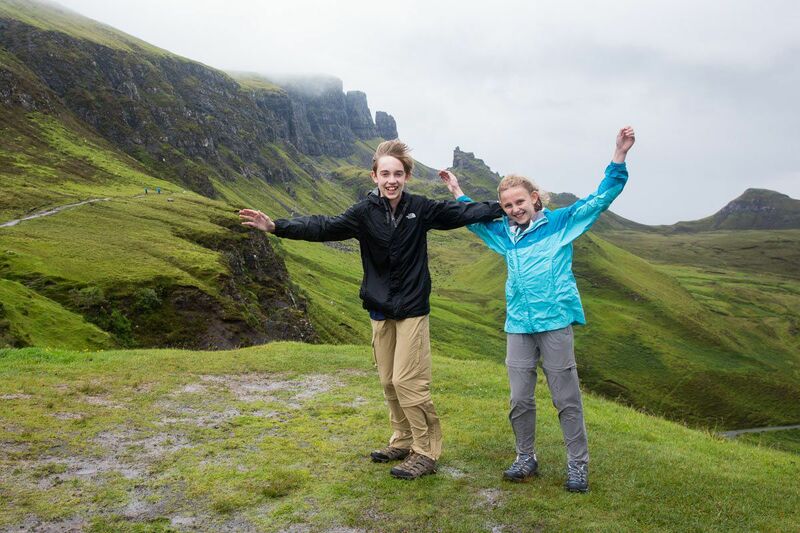 I am so glad we got to see the Quiraing. Sunny conditions would have been ideal, but would it have been as fun? 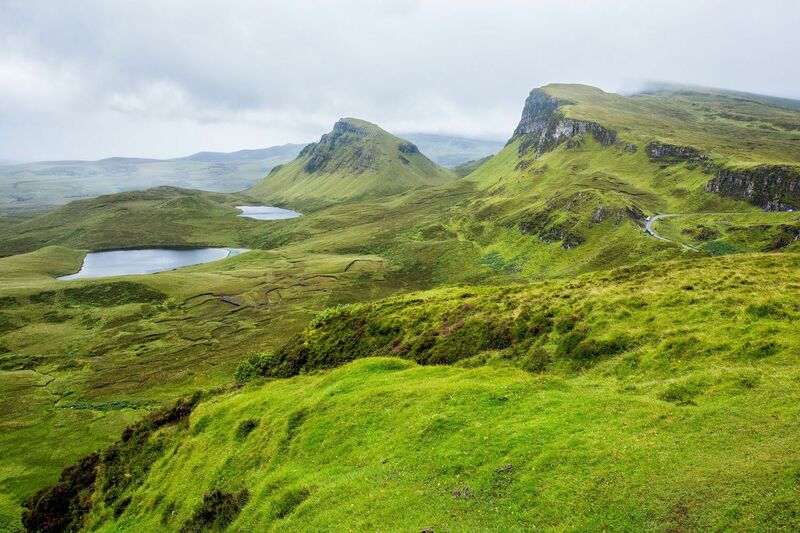 The Quiraing is located on the Trotternish Loop on the Isle of Skye. 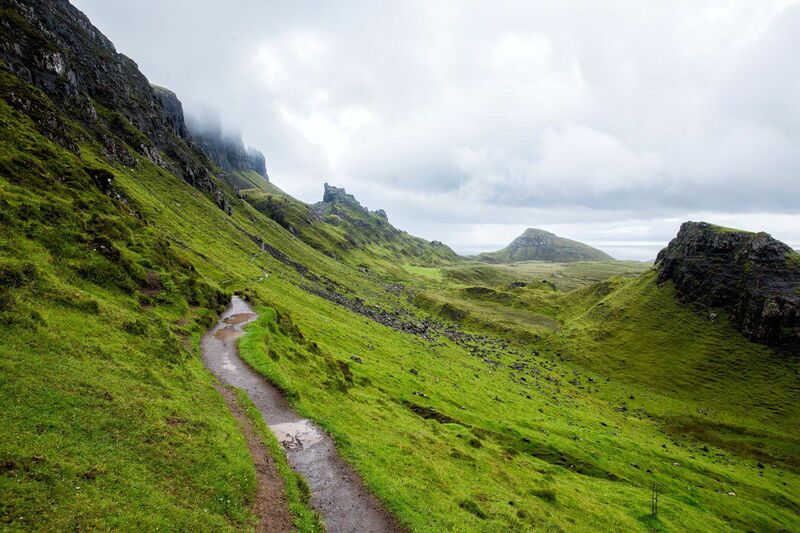 To get to the Quiraing, take the single track minor road connecting Uig with Staffin. This narrow road can become quite congested with cars during the busy summer months, so if you are traveling here during this time, have patience, especially between the busier hours of 11 am to 3 pm. 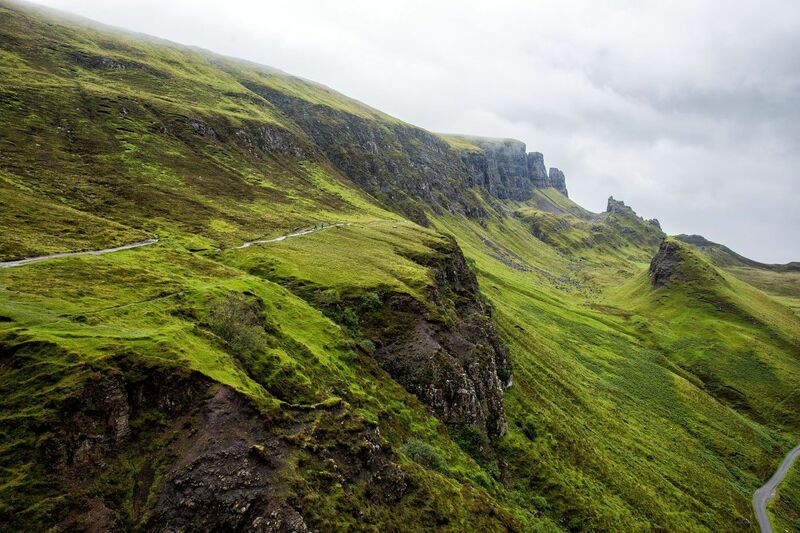 There is a large car park at the Quiraing. If there are no spots available, then drive a few hundred meters down the road towards Staffin, where there are several smaller turn-offs for cars to park. 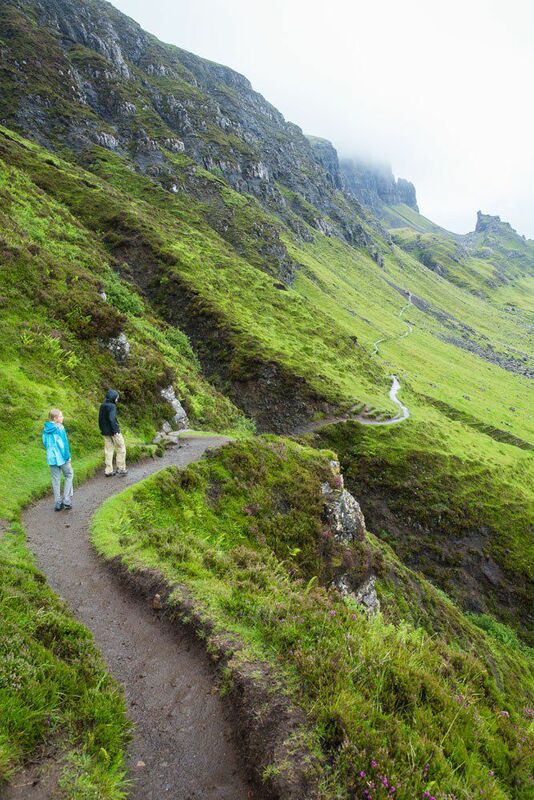 If you do not feel like hiking or walking far, you can still see the best of the Quiraing by walking 200 meters on the main trail. The landscape really opens up here and you will be rewarded with stunning views. 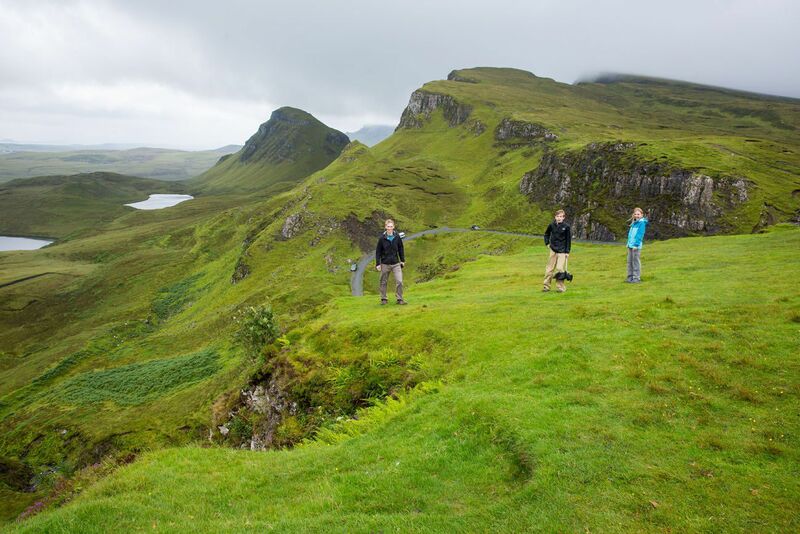 There is a 4.5 mile (7 km) circuit you can do through the Quiraing. 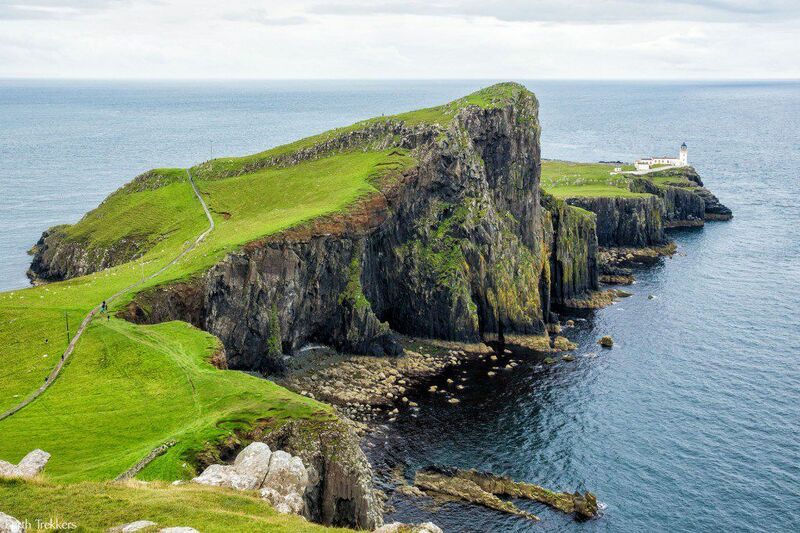 This hike takes you up and over the pinnacles, for amazing views over the Isle of Skye, and then down along the path we hiked. Allow approximately 2 hours for this hike. 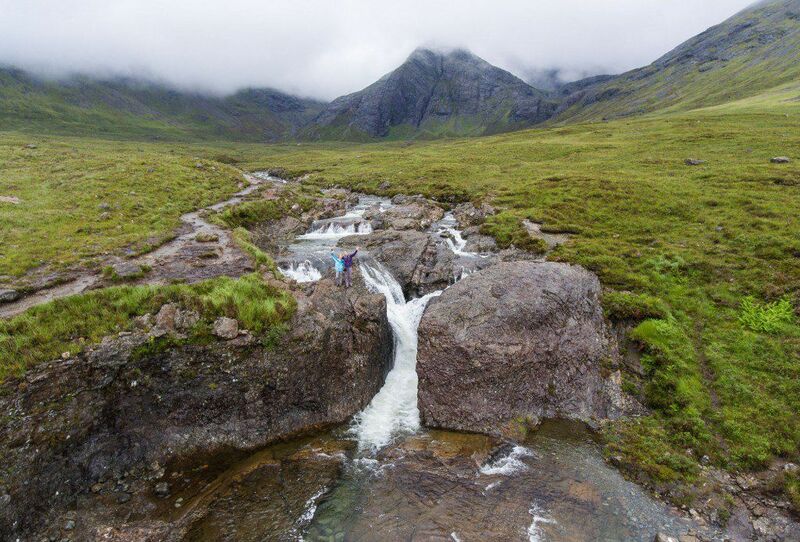 For a detailed guide on the entire hike, visit the Walk Highlands website. The full circuit should only be attempted during clear weather. Windy, rainy conditions makes the full circuit dangerous. 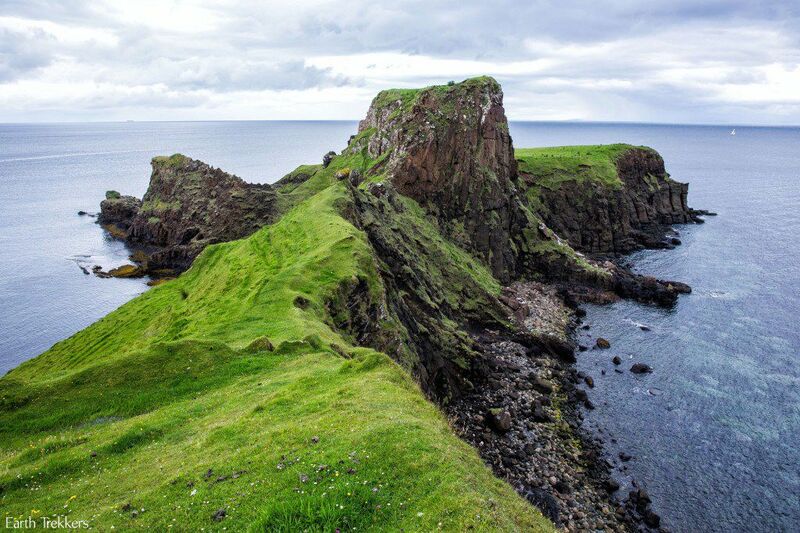 Plus, visibility will be low, so you will not be able to appreciate the dramatic views over the Isle of Skye. If it is raining, you can hike along the level trail out to the pinnacles. Expect the path to be muddy and slick, but it is still safe under these conditions. There is a short section where you will hike down to the base of a waterfall and up the other side. 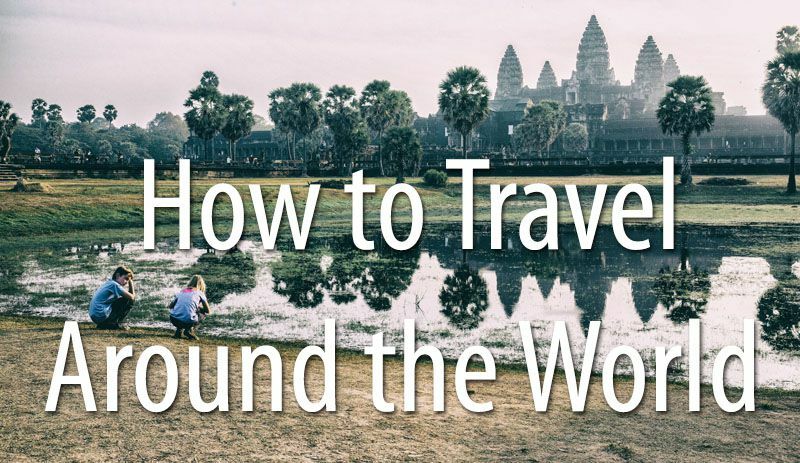 This is not difficult, but take your time here if it is raining. The rocks here can be very slippery. Generally speaking, rain showers do not last long in Scotland. 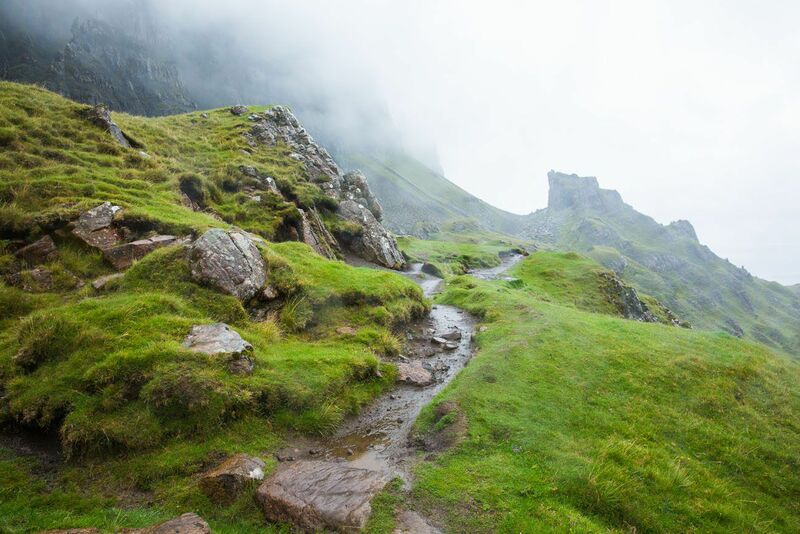 If you arrive at the Quiraing and it is pouring, be patient. Sit in your car and wait for the rain to end. Most likely, this rain will wash away the other visitors, and once it clears up, you may have the trail to yourself. This happened for us several times on the Isle of Skye. 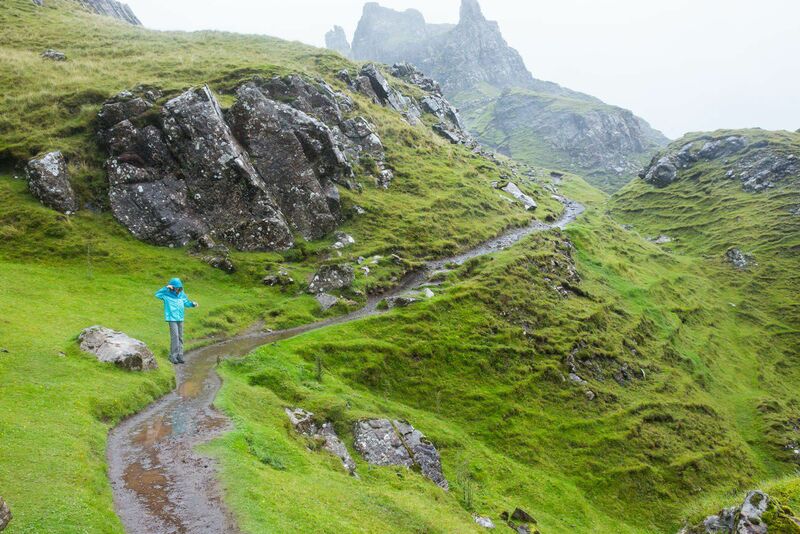 Even in the rain, the Quiraing is beautiful! 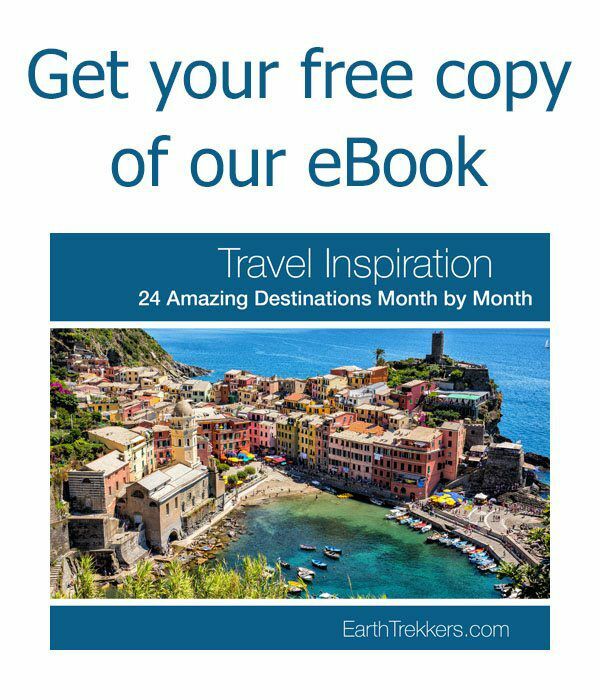 Loch Ness and Urquhart Castle…Are They Worth It? I plan to visit isle of Sky in this summer 2019. 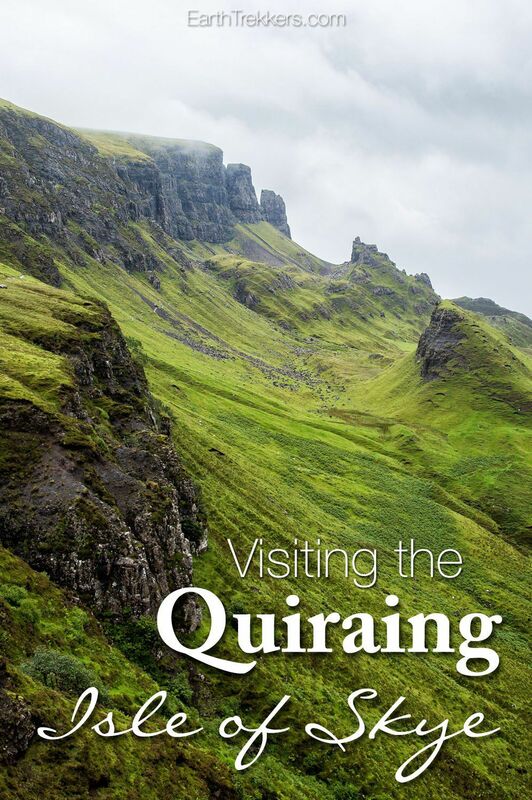 I’d to ask what is the best direction to go quiraing. From Uig direction or from Staffin direction ? I know the road is kind of narrow. I want to avoid the passes in traffic on such narrow road. 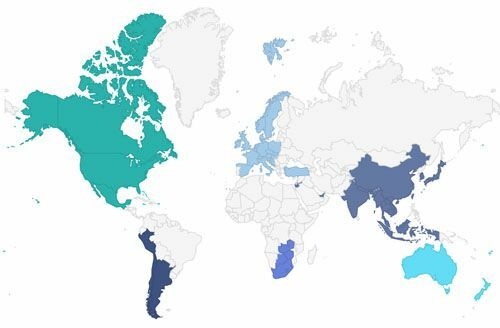 I wanted to say you’ve got a great site here! 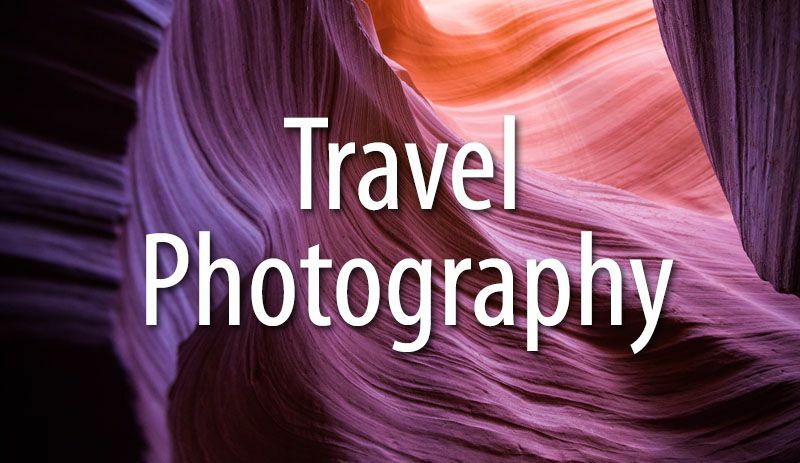 I’ve been using your site to plan vacations for some now and I always have the greatest time! 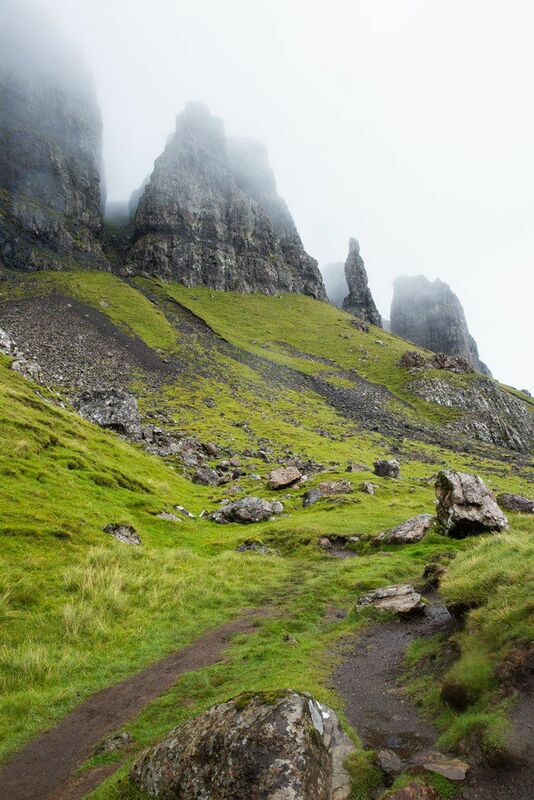 I’ll be going to Scotland this September and to the Isle of Skye, but it looks like I’ll only have time to hike either the Old Man of Storr or Quiraing; do you have any recommendations on choosing between the two hikes? Thanks! I guess my biggest question is how do you protect your camera in the rain?! What do you use? How long did it take you to hike the portion that you did? I’m headed off in 2 weeks! Luckily I’m from Seattle so the “rainy” season isn’t too much of a concern. I’m trying to save a little time and I’m thinking of not scheduling myself for the the entire 2hrs needed to complete the total trail. We spent about an hour total (round trip), maybe slightly less, to get out to the pinnacles you see in the photos. Thank you for posting such helpful information! 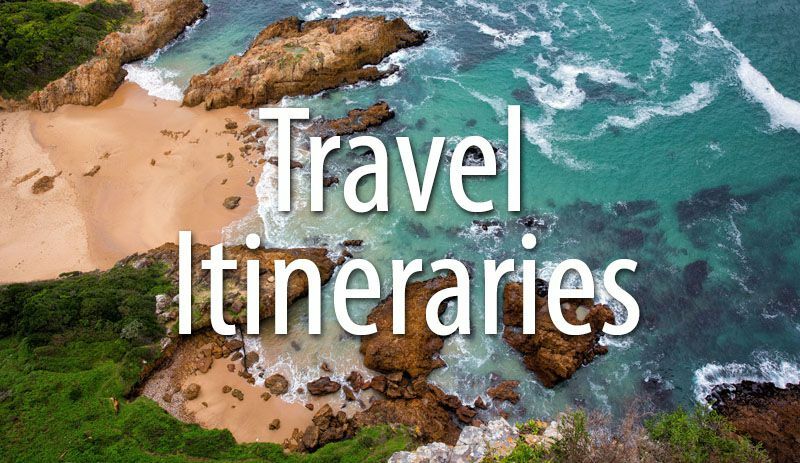 I have been continuously referencing your site for my trip planning. Unfortunately, I am not finding any information anywhere about parking. 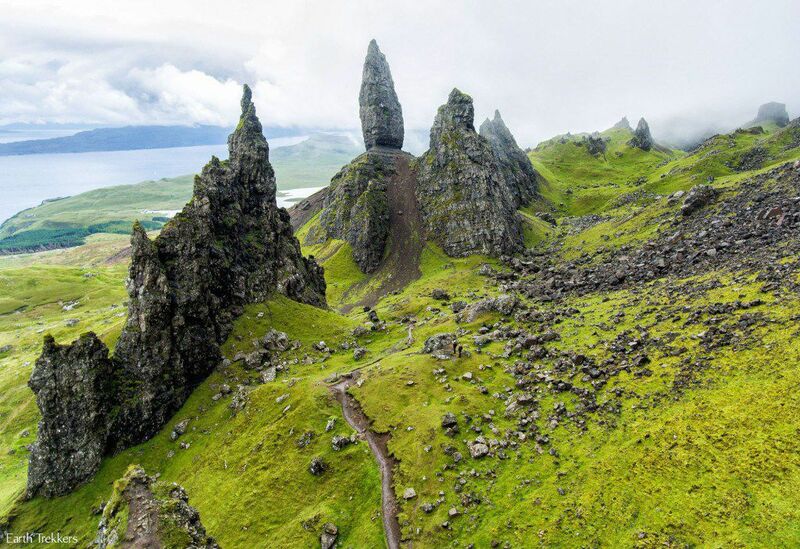 Are there parking/admission fees at any of these areas on Skye? And do you happen to know anything about overnight parking in Portree? I was there in August – probably around the same time as you! 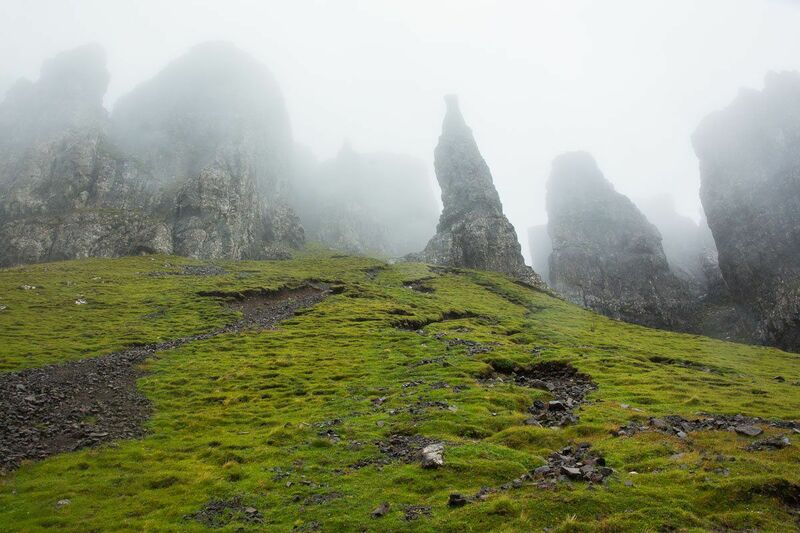 I did the Flodigarry – Storr trek in horrible weather conditions, camping on the Trotternish Ridge 😉 But it was still stunningly beautiful! Sooo, how do you say that?